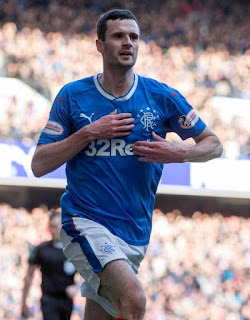 Rangers’ Director of Football Mark Allen has formally confirmed for the first time that an agreement in principle is in place to make Jamie Murphy’s stay at Ibrox permanent. The on-loan Brighton winger had a stellar start to life in Govan following his January switch, but lost his way a little after the disappointing loss at Ibrox to Celtic in March – however his last two displays have been a bit more like what fans expect and he stood out as Rangers’ best attacker at Easter Road in the 10-goal thriller. Allen has now verified what we all knew, and that the verbal agreement to make the deal a full contract is in place, and it is a case, presumably, of Steven Gerrard now making the final call as to whether he wishes to take up the offer on the Scotland cap. The ex-Motherwell man is certainly one of the better components of the squad, and is very much playing for the shirt while being on record as loving life at his boyhood team, but time will tell if his new manager wishes to see more of him. Good addition. Murphy has shown he can be dangerous and offers a goal threat from wide left. Playing wide of our midfield lately has been very difficult and with that in mind I believe he will be much more effective with better players around him. Getting players in will be the easy bit, getting the likes of Holt, Halliday, Herrera et al out the the door will be difficult. That happens when you give players contracts way above the ability they have. I would not keep Murphy. Far better to get the Kilmarnock winger who is far quicker and would only cost one million. Heard this is on the money. God knows, back up for Arfield?? He will be back up to Arfield unless he can oust him. That's the way Stevie rolls!! He’s one of only a few I would keep that I believe would improve with better players around them Murphy Tav John Candeias moelos mcrory jack & the 2 goalkeepers. Thats it for me, poss Dorrans & Rossiter if they can impress during pre season. The rest must be offloaded asap. Look forward to next season. Murphy commits defenders with his trickery and speed running with the ball. Candeias on the other side, for me, doesn’t commit defenders with trickery and pace and is much easier to play against. Work rate doesn’t cut it and should be a given. If I’m keeping just one, Candeias would be out the door. Not so sure. Seems to me that Allen was confirming that yes there was an agreement in principle that Rangers had first shout but that it isn’t binding or a done deal. He has done okay - but maybe Arfield is his replacement. Frankly if we do keep Murphy then he is the only one of the loan quartet that we should keep. Martin has been a disaster. Goss too weak. Cummings has not done enough and has too much to learn to play the modern striker role. I agree he has been the best of the loan players. Trouble will e the cost. If it is more than £1M, would we not be better with Jordan Jones from Killie. Younger, faster, less experience but may be cheaper to buy, certainly cheaper wages. I like Murphy, but he died with the rest of the team against Celtic.